The original cord set for your Singer Featherweight, 301, or other vintage machines featured the Singer Bakelite plug. Unlike the reproduction molded hard rubber plug sold by most of the vintage machine parts dealers, this plug properly fits the round pins on the plug socket on your machine. The wall plug is the Belden hardware, same as the original Singer plug. The wire is 16 gauge and is extra long, so you can place your machine wherever you want on the table, and your foot controller wherever you want - no more too-short cords. The wire ends for the foot controller have soldered ring fittings so they will not slip out from under the attachment screws inside the foot controller. And to top off the package, an attractive red Velcro cord keeper is included. This is the nicest cord set you can buy for your Featherweight, 301, or other Singer that takes the Bakelite 3-prong plug. 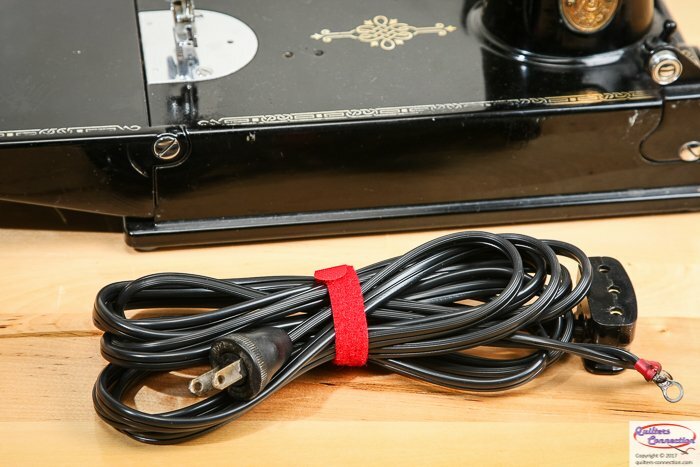 If you are tired of fighting the tight fit of the repro molded rubber cord sets, you will love the way the original Singer Bakelite plug fits your machine.